An unintentional error is an unintentional wandering or deviation from accuracy. 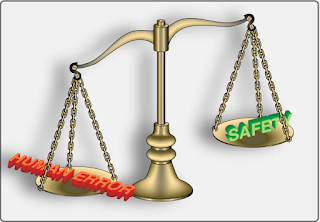 This can include an error in your action (a slip), opinion, or judgment caused by poor reasoning, carelessness, or insufficient knowledge (a mistake). For example, an AMT reads the torque values from a job card and unintentionally transposed the number 26 to 62. He or she did not mean to make that error but unknowingly and unintentionally did. An example of an unintentional mistake would be selecting the wrong work card to conduct a specific repair or task. Again, not an intentional mistake but a mistake nonetheless. In aviation maintenance, an intentional error should really be considered a violation. If someone knowingly or intentionally chooses to do something wrong, it is a violation, which means that one has deviated from safe practices, procedures, standards, or regulations. An active error is the specific individual activity that is an obvious event. A latent error is the company issues that lead up to the event. For example, an AMT climbs up a ladder to do a repair knowing that the ladder is broken. In this example, the active error was falling from the ladder. The latent error was the broken ladder that someone should have replaced.